Today me and my friend just found a american shorthair cat that didnt have any food. When we touched its stomach we could feel that it was barly breathing and we could feel its rib cage. What should we do????? Um, a Vet? That would be common sense. ya. a vet would definately help. lol. I think a vet would be very nice because these cats are fragile.For instance,my American Shorthair had his tail shaved down to the bone by my other cats and dogs it’s on the brig to falling off so ALWAYS have a few vet names in case one isn’t in town and the cat is injured. if the cat was barely breathing and you could feel its rib cage then you should take it with you and give it the proper care it deserves. You must feed it well and make sure you give it water too. Also what you should do is take it to a vet if it is very ill it may have to be put down i dont like to say it but it might be the only way if you cant take well enough care of it. take it to the vet!!! I do not know if I have a American Wirehair or a have a american Shorthair car, but my question is do both of these types of breeds meow a lot. This is a great website. I love animals in general, although I tend to favor cats over dogs. These American Shorthair’s are my favorite type of small cats. I love tigers and the other big wild cats. its great information thank you. keep up the spectacular work and research. i’m not allowed to have a pet. but for sure this type will be mine soon. so cute ever ! certainly i would like to call him jedediah. My cats are very picky at times and their sisters so they FIGHT A LOT!!! They’re names are Bigou (frence for GEM!) and Brenna. Bigou (gem!!!) is Calico and Brenna is white with black spots (she’s a cat, NOT A DOG!!! Note that in your MIND!!!). Bigou is the hot spot. Brenna is the Chicken cat. They are kind(NOT!!!) and generous (HARDLY!!!). They LOVE to play more than anything!!! They LOVE food ( Well, Brenna, that is). Give them anything but chocolate!!! that would be ‘bijou’ [bee-jU]. and it’s more in the line of ‘jewellery’ than ‘gem’. 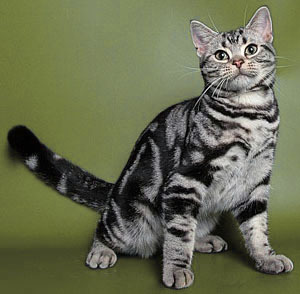 Wow … the American Shorthair cat comes in eighty different colors. The one in the pic is a beauty. Love the muscular tail. awesome site i learned so much about cats! I’ve had quite a few Tabbies. I loved them. I have a large light grey American Shorthair named Leo. He is gorgeous and very funny! I picked him up at the Shelter for $10. Great kitties don’t always need to be kittens! Large cats need homes too! Do yourself a favor and give a full grown shelter kitty a home…it will be a kind and wonderful thing! I found a med hair American cat on a hwy. She was about 3 to 4 weeks old. She is grown now and will not show herself to strangers who come into the house. Very picky eater. No fish, or seafood. Loves dry food but not can. Very loving towards me. But she has extra skin from her hind legs towards the front of her body. Two people said she had a breed in her that certain cats have this extra skin so they can jump further than any other cat. HAS ANYONE HEARD or know of such? We adopted Biscuit for $80, from a humain society at the Pet Smart. The previous owner classified Biscuit as a domestic short hair cat, adding its mom is known but, not dad. Biscuit has face like american short hair cat but its tai is sharpened, or edged away in the end, not sturdy ooking like the picture shown on this website. Biscuit has a long body, athletic, very playful, very picky with food and litter. It’s been four months since he was adopted, we haven’t been successful to introduce different brand food(Pro Plan, chicken and rice ony) or pine litter. Anyone has been successful to change its food or the type of litter? Do these cats shed less because they are short hair?